What most nervous fliers don’t realize is, turbulence is normal and it can occur even when the sky appears clear. If you are a nervous flier, don’t be embarrassed to let the crew know during boarding. Flight attendants are trained professionals. If we know you’re scared we’ll go out of our way to be reassuring if the airplane does encounter a few bumps. I’ve gone so far as to sit in an empty seat beside someone and hold their hand. It’s better not to wait until you’re clutching the armrest for dear life and sweating profusely with each bump to let us know who you are. If there’s time during boarding we might be able to introduce you to the cockpit. Pilots are better able to calm nerves by letting passengers know what to expect in terms of when it will happen, why it happens, and for how long it’s scheduled to last. Aircraft fishtail during turbulence, making the back of the airplane much bumpier than the front, so one good trick is to book a seat as close to the cockpit as possible. If that’s not possible, get to the airport early so an agent can switch your seat to a more desirable location. Airlines block the best seats for frequent fliers. Frequent fliers use miles to upgrade and a lot of times their upgrades don’t go through until the last minute, so be patient with the agent if they ask you to have a seat in the terminal. If that doesn’t work, tell a flight attendant what’s wrong and we’ll try to move you. Also, don’t forget to count the number of rows from your seat to the closest exit door or window. If something does happen and it’s dark, you’ll be able to feel your way to safety. While passengers dread turbulence, what leaves flight attendants ￼￼￼shaking are in-flight confrontations. It’s a really big deal for us to walk off a flight or even have a passenger removed. Really, we do not enjoy rocking the boat—or in this case, the plane—but sometimes we have to. There’s no calling the cops or the fire department or an ambulance at 35,000 feet, which is why we always try to take care of potential problems on the ground. Does it come as a surprise to learn intoxicated passengers have a tendency to turn into trouble after a few too many? The reason they seem tipsier in the air than on the ground is because of lower oxygen levels in the blood. The same amount of alcohol goes a lot further at 35,000 feet. While rarely a threat to the safety of the aircraft, unless of course they’re threatening to shoot the flight crew with a 9mm handgun like one drunken passenger did on a flight from Cuba, they do have a tendency to wreak havoc. I’m positive this is one reason why it’s against FAA regulations for an airline to board someone who appears to be intoxicated. If an airline gets caught knowingly doing so, they will be issued a fine. It’s not hard to spot inebriated passengers when they walk on board and announce, “Let’s party and have some drinks!” Those we know to keep an eye on. It’s the quiet ones we have to worry about, the ones who ask for a cup of ice, and that’s it. That’s a big red flag that there might be a little something-something hidden somewhere. Like bartenders, we’re responsible if anything bad happens to passengers who’ve had a few too many drinks after they leave our flight. That’s why we don’t allow passengers to bring their own booze on board, why we don’t automatically serve free drinks when there’s a delay, and why we’ll cut people off if we feel they’ve had enough. It’s not always possible for a few of us to keep tabs on so many of you, so some people do squeak by. For instance, after serving a very large first-class passenger not that many Jack and Cokes, we couldn’t stop him from coming into the galley and eating leftover shrimp tails (i.e., garbage) he picked off used passenger meal trays ￼￼￼￼￼￼￼￼￼￼￼￼￼￼we were stacking back inside the carts after the dinner service. Then there was the elderly woman who drank four vodkas within an hour after takeoff. I had no idea my coworker had just served the sweet old lady a double when she flagged me down and asked for “two of those cute little bottles.” Once we realized our mistake, it was too late. Our crazy little granny with the thick Irish accent was attempting to christen the entire coach cabin with water from the lav on her dripping hands. When one of my colleagues tried to talk her into taking a seat (near the back of the cabin so we could keep an eye on her), she screamed something I will not repeat about my colleague being gay. I don’t know what surprised me more, Granny’s potty mouth or the fact that my coworker didn’t have the gay mafia waiting for her after our flight. I also always love the passengers who use their seat back pocket and/or that of their neighbor, as a barf bag. And the ones who lock themselves inside the one and only first-class lavatory—and never come out. One hot young thing, determined to talk a couple of male passengers into buying her drinks, once made the rounds on a flight overseas until one of my coworkers confronted the underage girl in the galley. The girl responded by punching my colleague in the face. Now, if that had been me I don’t know what I would have done, but my Puerto Rican coworker, a petite young thing herself, didn’t skip a beat. I can’t tell you what happened next, but I will say I just stood there stunned because girlfriend had just messed with the wrong flight attendant. I am a white-knuckle flier. I’m involved with an FA who helped me through some turbulence on our flight! Hi Heather. I’m featuring your blog post on Turbulence Forecast’s Facebook and Twitter streams. We’d appreciate a shout out to http://www.turbulenceforecast.com for all your nervous followers! 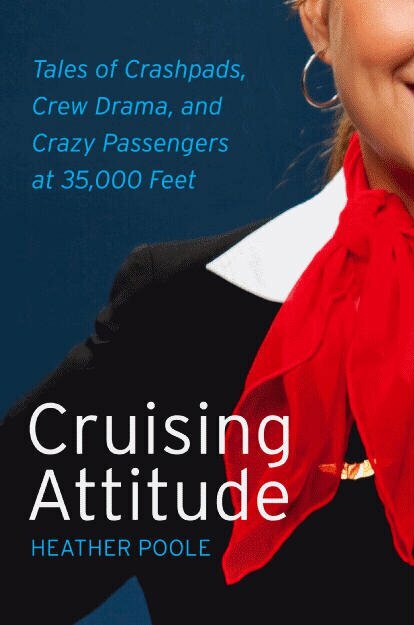 I once bit off an entire set of acrylic nails during turbulence,where the captain told the flight crew to be seated also. Thanks for the info,I’ll be sure to let the FA’s known next time I fly! Wow, it sounds like you’re a flight attendant who pays attention to the passengers getting on board. As someone who traveled heavily for business, I’ve had more than my fair share of drunkards wreak havoc on a plane that should never have been allowed on in the first place. For example, there was the guy who somehow lost his boarding pass by the time he got onto the plane. When he couldn’t figure out where he was supposed to sit he finally staggered into the seat beside me and sat down. As soon as the plane began taxiing he started puking all over the place. Shockingly, no one seemed to notice this. So I got to sit around puke for the entire 2 hour flight.